It’s that time of the year (again.. comes round quickly, doesn’t it?) when our minds turn naturally to consideration of year’s momentous events, significant people and lists of achievements: best ofs, worst ofs, winners, losers, who’s left us, who’s up, who’s down, who’s in, who’s out… The world has its power lists, and so should the Church. In the seemingly eternal quest for hierarchical supremacy in an era of competing rights, societal fragmentation and adversarial identity politics, you may have observed the emergence and proliferation of certain media ‘power lists’ – the Top 100/50/10 Asians, Women, Asian Women, Feminists, Gay Feminists, Asian Gay Feminists, Muslims, Sikhs, Blacks, Disabled, Secularists, Humanists, Secular Humanists, Gay Secular Humanists, Environmentalists, Haggis-making Nationalists, Sportsmen with Autism, Reggae-singing Rastafarians, etc, etc, etc..
Why should we only celebrate dead saints? Surely those who serve God and advance His Kingdom would appreciate a little encouragement while they live? Some run the race with fire in their hearts. Why should they not be celebrated? Some give up everything to serve the Lord. Why should we not hear of their mission? Some just get on with it, quietly, humbly, unseen, unknown. Why should they not be made known? If it is not they who selfishly seek an earthly reward, what is wrong with seeing their faces and telling their stories so that others might hear of the signs and wonders that witness to the love of God and the transforming power of Jesus? There was more (much, much more). Funny, isn’t it, how those who laud the Church of England’s ‘Funeral Celebrant of the Year‘ mock and pour scorn on this initiative. What’s the difference, other than a much broader, richer, ecumenical celebration of ministry and mission? Power lists of the Top 100, Top 50 or Top 10 may be part of what we call ‘celebrity culture’, and they may be obsessed with assertions of identity or the propagation of minority interests, but, for good or ill, that is now the dominant culture of the Western world, and Christians either adopt, engage and transform it, or shun, denounce and pour scorn upon those who might see a missiological opportunity. Since the world has celebrities, why shouldn’t the Church? If the world spreads its message through fame and renown, why shouldn’t Christians promote worthwhile ministries or recognise those individuals whom the world often overlooks? To inculturate is not to compromise: it is to become all things to all people in order that they might be saved. ..To rejoice in what God is doing in and through the Church right now is to savour God’s love for the whole world. When we hear great stories of individual Christians following in Jesus’ footsteps, being salt and light in a world full of darkness, they can and ought to spur us on to deepen our faith and respond accordingly. When any of us chooses to pursue God’s calling beyond a self-centred life, we should expect to see wonderful things. This power to transform the world is simply not restricted to a select few. And so into 2016: the #CranmerList is yours. It is compiled democratically from your nominations, and the ‘Top’ Christian is the one who receives most nominations (which are not pre-disclosed: there is no voting). Past winners include the ‘Vicar of Baghdad’ Canon Andrew White (2014; still contending for the Faith); and Nissar Hussain (2015; still enduring persecution). Please note that this is the Top 100 UK Christians: Nominees must be living and citizens of the United Kingdom, so please don’t nominate Jesus or the Pope (someone does, every year). Their ministry may, however, be wider than teaching, preaching, pastoring or witnessing in the UK: it may be to anywhere in the world. 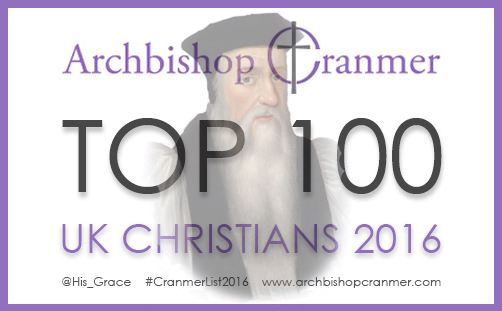 Please note also the the #CranmerList is designed to recognise profound and remarkable Christian service in a given year. If you believe that Her Majesty the Queen deserves to the top honour, please cite how she has distinguished herself this year. You are free, of course, to nominate Fred for hoovering the church carpet every week; or Rosemary for her faithfulness in serving teas week after week for the men’s prayer breakfast. But, as commendable as this service may be for the kingdom, the point of the exercise is a consideration of spiritual influence in the world, focusing on Christians whose ministry is significant in the public realm; those who labour in the vineyard, contending for the Faith, whose fruits are discernible and compelling. So, as you consider your nomination(s), do not just ask yourself, ‘What has this person done for us?’ (where ‘us’ is the Body of Christ and the communion of saints), but also ‘What has this person done for the mission of God and the cause of Christ in the world?’ If their ministry is principally in and to the Church, have they sufficiently inspired others to follow Christ; to go out into the world and reflect upon the treasures of eternity? If their ministry is in and to the world, does it reflect the peace, truth and mercy of a loving God? What, if anything, distinguishes it from secular social intervention? Do they foster unity or division? Are they gracious or conceited? Do they speak, sing or write with divine wisdom, passion and insight, or go on about carnal obsessions and material desires? In short, are their eyes fixed on Jesus? Nominations will close at midnight on Sunday 11th December. The winners will be announced on December 31st, coinciding with the world’s New Year Honours. Please (final plea) ensure that your citation is included for their exemplary witness this year: ‘nice bloke’/’good egg’/’loves Jesus’/’Great man of God’ won’t quite cut it.